In the first blog post of this five-part series, Professor Jean-Paul Faguet summarises a recent article he wrote in which he suggests we can open an analytical window into the causes of the rapid collapse of previously stable political party systems by examining the experience of Bolivia. Click here to hear Duncan Green’s interview with Jean Paul Faguet on what Bolivia tells us about rapid collapses of Political Party systems. Across Europe, the UK and the US, the decline of mainstream political parties, and the resurgence of populism, have been evident for some years now. As the phenomenon grows, it becomes clearer and clearer that this is not limited to certain charismatic leaders, like Geert Wilders in Holland, or particular policy issues, like immigration. Something far bigger and deeper is at work. Witness the collapse of all of Italy’s major political parties, which governed the nation throughout the post-war period. The rapid decline of France’s center-right and Socialist parties is another example. The current upheaval on both sides of American politics is a third. Throughout the West, not just particular parties but entire party systems are losing their relevance. By ‘party systems’ I mean parties arranged in a competitive equilibrium along a left-right, worker-capitalist ideological axis. Having dominated the 20th century, and presided over enormous social and economic change, these systems are suddenly disintegrating around us. Well-prepared, experienced leaders are unable to mobilize traditional coalitions of voters. This allows established parties – even entire countries – to fall into the hands of charismatics and extremists. What’s causing the collapse? Is it somehow tied to deeper changes in society? What’s likely to come next? To quote both Niels Bohr and Yogi Berra: predicting is hard, especially when it concerns the future. But as I argue in an article just published in the Journal of Democracy, we can open an analytical window into the future by examining the experience of Bolivia. Bolivia? I can hear you think. Yes, Bolivia. Precisely because it’s one of the poorest countries in the western hemisphere, Bolivia’s politics were never as institutionalized, nor its parties as strong, as those of richer, more developed countries. But it has suffered many of the same economic shocks, technological disruptions, and social and environmental changes as far more developed countries. Which is why the disintegration of its political system began earlier, and proceeded faster, than elsewhere. Adjusting heavily for context, Bolivia offers useful insights into how political disintegration works, and clues about where it may be going. During the second half of the 20th century, Bolivia’s political party system was a surprisingly robust component of a famously fragile democracy. Why, early in the 21st century, did it suddenly collapse, to be replaced by the gigantic figure of Evo Morales and his comparatively loose Movimiento al Socialismo (MAS)? To understand political collapse and the birth of a new system, we must first understand how the old system worked at its peak. 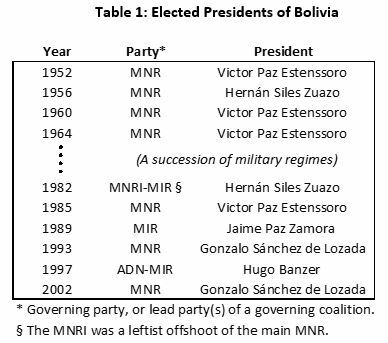 Although Bolivia suffered many coups in its first 190 years of independence, from 1953 onwards its politics was characterized by a party system arrayed roughly along a left-right, labor/peasant-vs.-business/capital axis typical of the twentieth century, which was remarkably stable. So dominant was this system that the same parties – indeed the same individuals – survived coups, civil disturbances, guerrilla insurgency, hyperinflation and economic meltdown, and striking social change – returning again and again to take up the reins of power. Why did it suddenly, unexpectedly collapse in 2003? Bolivia’s 1952-53 revolution overturned a quasi-feudal society, extended full citizenship rights and education to the indigenous majority, quintupled the size of the electorate, broke up the haciendas, distributed land to the highland peasantry, and nationalized mines and other “commanding heights” of the economy. Following this vast social and economic upheaval, national politics coalesced around the MNR – a multiclass coalition party that straddled the center, representing peasant and labor unions, small and medium businessmen, and the professional intelligentsia; the ADN on the right, representing landowners, professionals and large businesses; and the MIR and MBL on the left, advocating for worker and peasant interests. Together, they reliably captured 60-75% of the national vote during the 1980s and 1990s. The dictatorships that ruled Bolivia between 1964-1982 tried on several occasions to remake its politics by outlawing established parties and sponsoring new movements. Their abject failure is evident in the lower half of the table, which shows the same parties – indeed the same individuals – returning to power once democracy is restored. Even this list understates the elite’s hold on power. For example, Paz Zamora served as Siles’ vice-president before becoming president; likewise, Sánchez de Lozada had been Paz Estenssoro’s minister of planning; and Banzer – dictator during the 1970s – headed the coalition that sustained Paz Zamora in power. All were educated, “white” Bolivians from the wealthy neighborhoods of four cities. In this context, the speed and scale of the system’s collapse were extraordinary. In 2005 the ADN, MBL, and MIR were unable to field candidates for the general election, and the MNR won only six percent of the vote; by 2009 it too had disappeared. In the 2010 local elections, the MNR polled zero votes in 323 of 337 municipalities, and the ADN did worse. The MIR and MBL had already ceased to exist. What happened? The proximate cause of system collapse was a proposed pipeline to Chile, the old enemy, which sparked large protests in 2003. These were violently put down by security forces, leading to the resignation and flight of President Sánchez de Lozada. Without doubt, the massacre of protestors by the state caused a severe political crisis. But in a country where social mobilization is high and protests common, it is simply not credible that a dispute over a gas pipeline killed off not just a presidency and his government – both understandable – but Bolivia’s political parties, party system, and the dominant axis of political competition. All of these had survived far worse. Foreign observers like Jeffrey Sachs (2003) blamed fiscal shocks and poor economic performance. But those are not credible culprits either. Although the fiscal deficit spiked upward in 2002, this was due to a sharp fall in revenues, not expenditures, which actually rose. Poor economic performance is even less believable. The economy had grown continuously since 1986. A system that survived hyperinflation two decades earlier was not toppled by 2.7 percent growth. Movimiento de la Izquierda Revolucionaria. Part 2/5 of the blog series will be posted tomorrow and explains Bolivia’s political collapse as a deep tectonic shift in its main axis of politics. The five part series is based on a recent article published in the Journal of Democracy. Professor Jean-Paul Faguet (@jpfaguet) works at the frontier between economics and politics, using quantitative and qualitative methods to investigate the institutions and organizational forms that underpin development. Specific fields include political economy, comparative politics, institutional economics, and development economics.